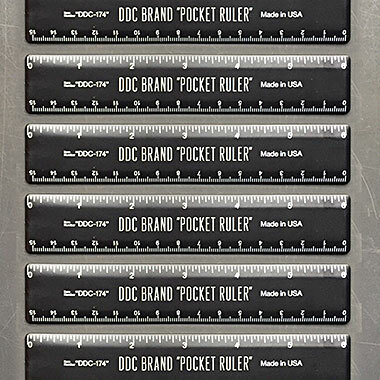 Draplin Design Co.: DDC-174 "Pocket Ruler"
We believe in facts. When you measure a Field Notes memo book, it’s 5-1/2” tall. That’s a fact. I like facts. I believe in facts. It’s a scary time in America. Facts are twisted and science is getting the middle finger by the current band of turds in the White House. I’d like to say this ruler could even measure the turd-in-chief’s comb-over, but then again, this humble instrument maxes out at six inches. Another fact. 03. Fits in a pocket, or pencil case. 05. Brute-force pad-printed ink application. 06. Proudly made in the U.S.A.
©2017 DDC Dry Goods Div., Merch Dept., Portland, Ore.